Train travel in Canada. . .
CN Tower, Toronto... The gleaming stainless steel of The Canadian to Vancouver waits to leave Toronto, under the shadow of the famous CN Tower - CN standing for Canadian National Railways, of course! 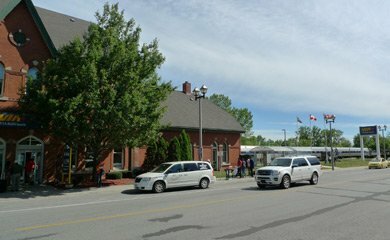 Canadian long-distance trains are run by VIA Rail Canada, www.viarail.ca (click 'home' top right). 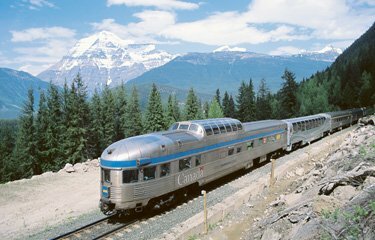 They're a great way to see the country, whether you travel on the inter-city trains between Toronto, Montréal and Québec, the Océan from Montréal to Halifax or Canada's classic trans-continental train, The Canadian from Toronto to Winnipeg, Edmonton, Jasper & Vancouver. As well as VIA Rail, there's the excellent Rocky Mountaineer through the Rockies between Vancouver & Banff, Calgary or Jasper. This page explains routes, timetables, prices & what the trains are like. VIA Rail, www.viarail.ca for train times, fares & online booking (click 'home' top right). Montreal/Toronto GMT-5, Halifax GMT-4, Vancouver GMT-8. Clocks go forward 1 hour from 2nd Sunday in March to 1st Sunday in November. www.canadatourism.com Montréal: www.tourism-montreal.org Toronto: www.city.toronto.on.ca Vancouver: www.tourismvancouver.com Québec: www.bonjourquebec.com Nova Scotia: www.novascotia.com. The greatest train in Canada and one of the world's greatest train journeys, VIA Rail's Canadian runs 2 or 3 times a week, linking Toronto, Winnipeg, Edmonton, Jasper National Park in the Rockies & Vancouver. 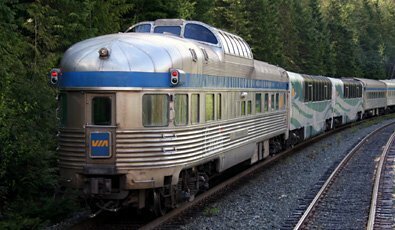 The whole journey takes 4 nights and the train consists of the original 1955-built stainless-steel coaches from the Canadian Pacific Railway's Canadian. 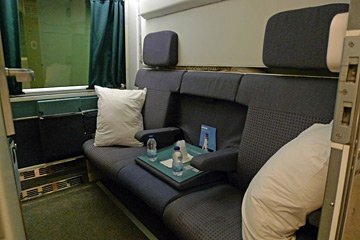 You can travel very affordably in Economy class in a reclining seat, or in Sleeper Plus class with a private sleeping-car room and restaurant car meals included. And there are deluxe Prestige class sleepers too, introduced in 2014. The journey originally took 3 nights, but in December 2008 VIA Rail changed the timetable to show their passengers more of the Rockies in daylight. Today's Canadian takes the more northerly Canadian National route across Canada via Edmonton and Jasper completed in 1917, the only passenger train now remaining on the classic 1885 Canadian Pacific route through Calgary & Banff is the Rocky Mountaineer tourist train, which only runs between Banff & Vancouver and only between March & November. The Canadian... Photos courtesy VIA Rail. 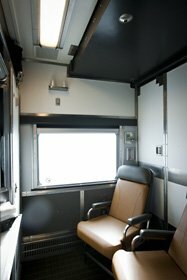 You can check times & fares for a specific date at www.viarail.ca. Remember this train crosses 4 time zones, all times are local time! Important: The Canadian shares tracks with freight trains and can run late, meaning hours not minutes. Do not book any onward train, bus or flight in the 24 hours after scheduled arrival so you can travel stress free and take things in your stride. The new slower timetable below introduced in July 2018 is designed to help ease the delay problem. * IMPORTANT: The Thursday departure from Toronto & Sunday departure from Vancouver only run between early May & mid-October. The thrice-weekly Canadian was cut back to running only twice a week in winter in 2012. 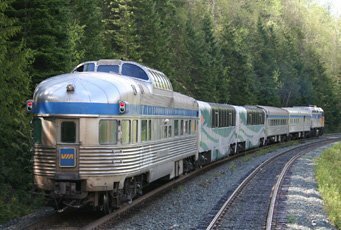 The Canadian will run Toronto-Jasper-Vancouver twice a week, with an additional train per week running between Edmonton & Vancouver. 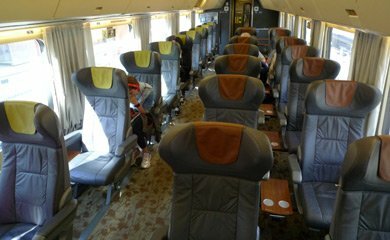 * = This Prestige class fare is per person, but assumes two people share the compartment. Can you stop off on the way? Yes of course, but each leg of your journey requires a reservation for a specific train & date. You can't buy an open ticket and hop on & off trains spontaneously without a reservation. 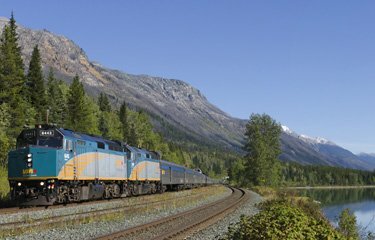 But it's easy to pre-book stopovers, as www.viarail.ca has a multi-city option which allows you to specify a Toronto-Vancouver journey with one or more stopovers at places along the way, such as Winnipeg or Jasper (for Jasper national park). Booking your trip using this multi-city feature is cheaper than buying a separate ticket for each leg. Buy tickets direct from VIA Rail at www.viarail.ca. Booking opens 331 days (11 months) in advance. You collect the tickets at the station before departure. In Economy class, look for a cheap non-refundable Escape fare. In Sleeper Plus class, look for the discounted fares. You can buy tickets between any of the stations at which the train calls, you don't have to do the whole journey. I recommend the Royal York Hotel as the classic grand hotel to stay in before leaving Toronto, directly across the road from Toronto Union Station. If you live in the UK, Ireland or elsewhere in Europe, you can buy VIA Rail tickets by phone from International Rail, call 0844 248 248 3. From outside the UK +44 844 248 248 3. Lines open 09:00-17:00 Monday-Friday. When in Canada or the United States, call VIA Rail on 1 888 VIA-RAIL (1 888 842-7245). 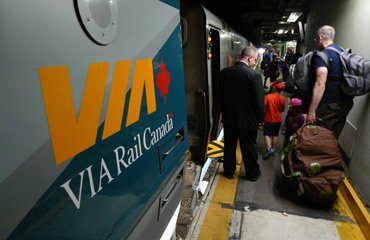 U.S.-based Amtrak Vacations works with VIA Rail Canada as well as Amtrak in the States. They're VIA/Amtrak specialists so they know what they're doing and can advise you better than most regular travel agents. They can customise a package to your own specification, either wholly within Canada or starting in the States. Lines are open 09:00-22:00 Monday-Friday & 09:00-17:30 Saturday, Eastern Time (5 hours behind the UK). In the U.S. or Canada, call 866-816-5892 toll-free or visit www.amtrakvacations.com. From the UK call 020 3327 3500 or visit www.amtrakvacations.com. From Australia 0011-1-978-816-7506, or visit www.amtrakvacations.com. If you want a train travel expert to arrange your whole trip for you, with trains, stopovers, hotels, transfers and (if necessary) flights all sorted, UK-based train travel specialist Railbookers can arrange holidays by train to your own specification. Just tell them what you want (or ask them for their suggestions) and they can make all your arrangements. They have UK and US offices. 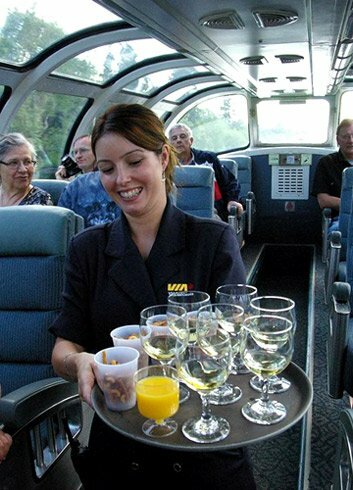 ...escorted tours across Canada by train. To travel across Canada with a convivial group of travellers escorted by a professional guide, contact UK-based Great Rail Journeys at www.greatrail.com, in the UK call 01904 527 120. They have tours leaving New York for LA & San Francisco between 1 and 5 times each month from April to October. What is the train like? Which accommodation to choose? In Economy Class (formerly Comfort Class) you have a comfortable reclining seat and access to the Economy Class Skyline car with its coffee shop, lounge and vista dome. All seats have a power outlet and you can buy a blanket & pillow set from the Skyline car if you haven't brought your own. Sleeping in a seat may not be as comfortable as having a proper sleeper, but the seats recline to around 40 degrees, have loads of legroom and adjustable leg rests. An Economy class seat costs a fraction of the price of Sleeper Plus class, and with a coffee shop, lounge area and observation dome, the facilities in Economy class are still excellent. It's an experience streets ahead of a mere flight, and vastly more comfortable than bus travel. Skyline car with economy class lounge, coffee shop & observation dome. Coffee shop in the Skyline car serving meals, snacks & drinks... Courtesy VIA Rail. This is the main sleeper option, formerly called Silver & Blue class and then briefly Sleeper Touring Class. I expect they'll rename it again next week. In Sleeper Plus class you have your own sleeping-berth in either an open-plan section or a single-berth roomette or a 2-berth bedroom, the fare includes all meals in the elegant Sleeper Plus restaurant car, and you can use the famous Park observation-lounge car at the rear of the train with its complimentary tea & coffee (although sadly, access times are being restricted from April 2017, see update below). 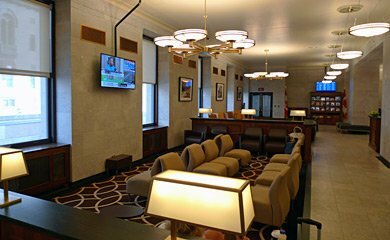 You can also use the business class lounge at Toronto Union Station. 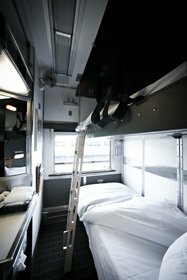 There are several different types of sleeper, all with hot showers at the end of the corridor. This plan of a typical Manor class sleeping-car will help you make sense of the different types. Above left, open-plan 'section' seating. Courtesy of James Chuang. Above right, the same area at night converts to upper & lower berths, each berth with a curtain for privacy. Courtesy of VIA Rail. 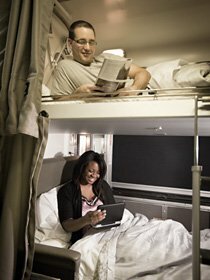 A step up in price from a section is a roomette or bedroom, described on the VIA Rail website as a cabin for 1 and cabin for 2. These are fully-enclosed lockable compartments. 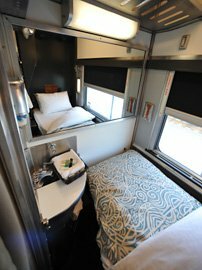 The price per person is the same whether you use a roomette or bedroom, if you are travelling alone you will be allocated a roomette. 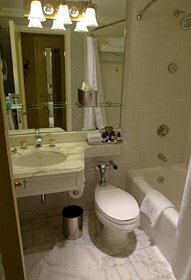 This is a very compact single room, just big enough for a large seat with plenty of legroom, and a leg-rest with a toilet bowl hidden underneath. There is a small washbasin in the corner. 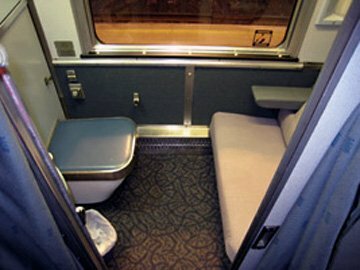 At night, a bed folds down from behind the seat, taking up almost all of the roomette, as you can see below right. 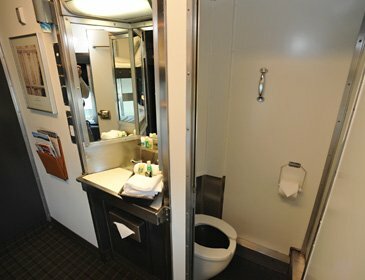 The compartment door locks securely, and there's a shower at the end of the corridor in each sleeping-car. Above centre, This photo was taken standing in the central corridor looking through the doorway into the roomette. It accurately shows the floor space in a roomette in daytime mode. The toilet is under the padded legrest. Above left, at night the bed folds down and takes up most of the compartment - you need to raise it to use the toilet! Above right, the foot of the bed tapers slightly to fit a washbasin in the corner. Photos courtesy of James Chuang & VIA Rail Canada. Also a step up from a section, a bedroom is an enclosed lockable compartment for two people. Your sleeper attendant converts it from seats by day to an upper & lower berth at night. There's a washbasin and small enclosed toilet inside each bedroom, and there's a shower at the end of the sleeping-car corridor. There are a very limited number of bedrooms for 3 people. The washbasin & toilet. Photos courtesy of VIA Rail. 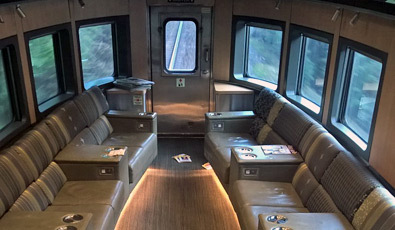 VIA Rail introduced a new luxury class on the Canadian in 2014, called Prestige class, being formally launched in 2015 (online booking will be available from March 2015). Prestige Passengers get a spacious sleeper compartment with double bed, en suite toilet & shower, flat-screen TV with video selection, complimentary mini-bar and an extra-large window. The bed converts to sofa seats for day use. 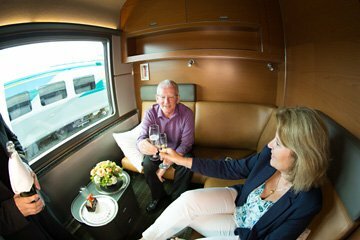 Prestige passengers get access to the same restaurant and Park car lounges as Sleeper Plus passengers, with meals included and priority booking over Sleeper Plus passengers for restaurant sittings. Two Prestige class sleeper compartments are housed in a rebuilt Park car at the very rear of the train, and there are 6 more Prestige compartments in a completely-rebuilt 'Chateau' class sleeping-car. Prestige class is now available on all departures, since summer 2015. Prestige sleeper, night mode. Courtesy VIA Rail. 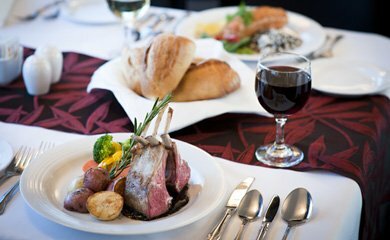 Meals are included in the fare for Sleeper Plus & Prestige passengers, although drinks are extra. Only sleeper passengers can access the sleeper class restaurant car, Economy class passengers have to use the coffee shop in their Skyline car. Sleeper Plus & Prestige passengers have exclusive access to the Park car at the very rear of the train. 18 Park cars were built in 1955 by the Canadian Pacific Railway, all named after famous Canadian national parks. One Park car is always attached to the back of the Canadian. It's the Canadian's signature car, the place to socialise - on busy summer departures there may be wine tastings or musicians playing here. The Park car features (1) the Bullet Lounge at the very rear, with a view back along the track, (2) a raised vista dome with seating, and (3) the Mural Lounge underneath the dome (it also features several sleeper compartments including on some departures a wheelchair-accessible 2-berth sleeper). All lounge and dome seats are available to all sleeper passengers on a first-come, first-served basis, and complimentary tea & coffee is always available here. I have to say I never had a problem finding a seat in either area, but that no doubt varies from time to time and trip to trip! One or two Park cars have already been rebuilt with Prestige class sleeper compartments and luxuriously refurbished lounges and dome, these photos shown an un-rebuilt car. 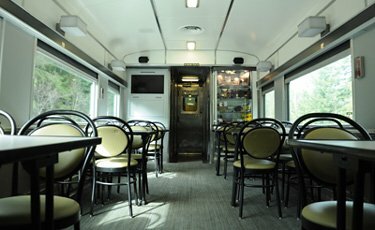 In summer, an additional Skyline lounge/coffee shop/dome car may also be added to the sleeper part of the train to give extra lounge and dome space for Sleeper Plus passengers. 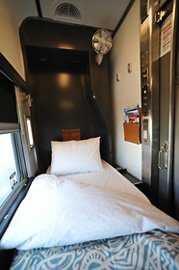 Update 2018: An unfortunate side effect of the introduction of Prestige class is that in peak season (late April to mid-October) regular Sleeper class passengers will only be able to use the Park Car 16:00-22:30, and not at all on the first evening after leaving Toronto or Vancouver. You'll still be able to use the observation domes in the Skyline cars at all times in all seasons. And you'll still be able to use the Park car at all times in the off-peak season. See www.viarail.ca for more details. Today's Canadian takes the more northerly Canadian National Railway (CN) route across Canada via Edmonton and Jasper, opened in 1917. The original 1955 Canadian was operated by the Canadian Pacific Railway and would have taken the CPR's own more southerly route across Canada via Calgary and Banff, opened in 1885 as Canada's first trans-continental railway and arguably the more scenic of these two competing routes. If you want to experience the original 1885 Canadian Pacific route today, you can only do so between Calgary and Vancouver, and only on the the Rocky Mountaineer tourist train running March to November. 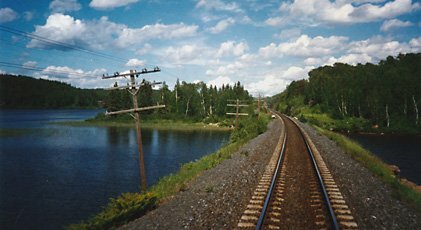 You'll find a brief overview of the history of the CN and CP routes across Canada here. Lakes and forests between Toronto & Winnipeg. The view from the Dome. In the Rockies, looking forward from the front seats in the dome. Journey's end: Vancouver's Pacific Central station. The Canadian in the platform at Vancouver. 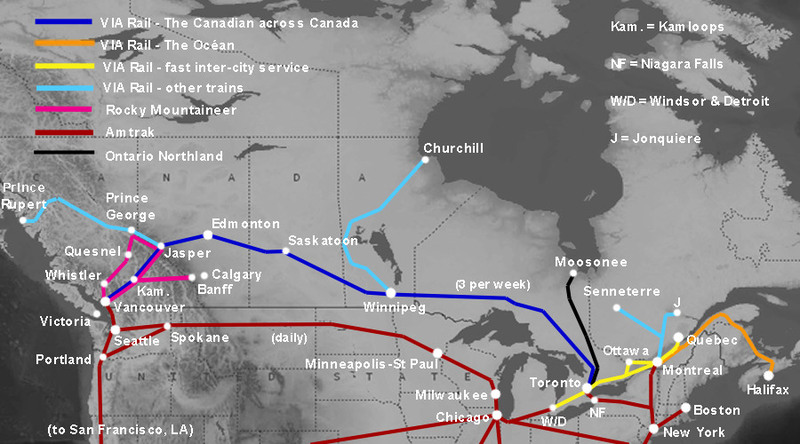 There were (and are) two competing trans-continental rail routes across Canada. The Canadian Pacific Railway opened the first trans-continental line across Canada in 1885, running from Montreal/Toronto to Vancouver via Winnipeg, Calgary and Banff. Instead of taking the easiest route through the Rockies via the Yellowhead pass, political tension with the United States led them to take a more difficult (and scenic) southerly route through the Kicking Horse pass. 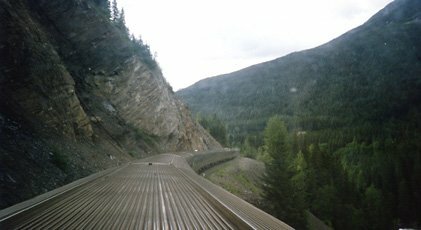 The second and later line, built around 1917 by the Canadian Northern Railway (nationalised in 1921 as Canadian National Railways or 'CN', as in the CN Tower), runs from Montreal/Toronto to Vancouver to the north of the CPR route, via Winnipeg, Edmonton, Jasper and the easier Yellowhead pass. VIA Rail was formed in 1978 as a government corporation to take over the passenger trains from these two private companies, which now only run freight trains. Initially, VIA Rail continued to run both the Canadian Pacific's Canadian and the Canadian National's Super-Continental daily on each of these two trans-continental routes, with the rolling stock getting progressively older and less reliable. 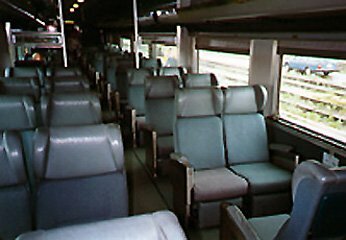 However, in 1990, this was reduced to one train, the present-day Canadian, running from Toronto to Vancouver 3 times a week via the Canadian National route through Winnipeg, Edmonton and Jasper. VIA Rail lacked the funds to buy new cars, so they completely rebuilt and upgraded the original stainless steel streamliner coaches built in 1955 for the Canadian Pacific's Canadian, making this train a real classic in its own right as well as transportation from A to B, albeit from a historical perspective running on the 'wrong' company's route. There are now no regular passenger services on the original 1885 Canadian Pacific route from Toronto to Vancouver through Calgary or Banff, apart from the excellent Rocky Mountaineer which runs between Calgary, Banff & Vancouver, 3 times a week April-October. Three times a week, a train runs the 836 miles between Montreal and Halifax Nova Scotia. See times, fares, info, and an illustrated account of the journey on the Montreal to Halifax page. The Man in Seat 61 says: "There's no need to fly. 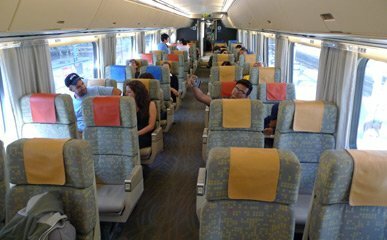 Comfortable VIA Rail inter-city trains link Toronto, Ottawa, Montreal & Quebec, centre to centre with no airport hassle. 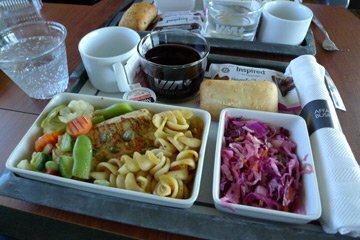 If your budget permits, upgrade to VIA's Business Class with complimentary hot meal and wine, attentive steward service and access to the Business Lounges at major stations. It impressed me, it's as good as anything we have here in Europe." 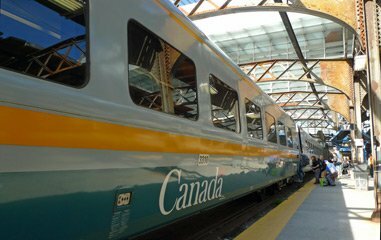 VIA Rail's fast inter-city trains link Toronto, Ottawa & Montréal. 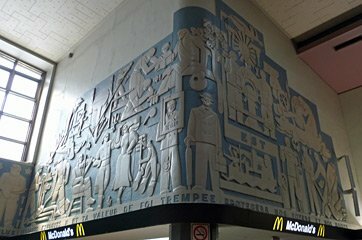 Montréal to Toronto takes as little as 4 hours 40 minutes city centre to city centre. Use the times below as a guide and check exact train times for your date of travel at www.viarail.ca. See the photos here! From Montréal to Québec, air-conditioned trains run several times daily, taking around 3 hours. Check current times, fares & book online at www.viarail.ca. Montreal to Ottawa takes 1 hour 50 minutes. Toronto to Ottawa takes about 4 hours 20 minutes. Montréal to Toronto starts at around Can$ 46 if you book in advance or Can$ 129 regular fare. Montreal to Quebec costs around Can$ 44 if you book in advance Can$ 104 regular fare. Toronto to Ottawa starts at Can$ 46, regular fare Can$ 129. Montreal to Ottawa fares start at Can$ 43, regular fare Can$ 80. The best way to buy tickets is online direct from VIA Rail, www.viarail.ca, just click the button below. Booking opens 331 days (11 months) in advance. Union Station sits in the centre of Toronto in the shadow of the CN Tower, just across the road from the wonderful and highly-recommended Royal York Hotel. 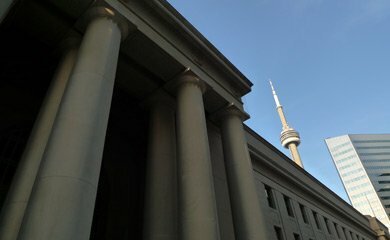 One of the world's classic railway stations, the current structure was built 1914-1920, see https://en.wikipedia.org/wiki/Union_Station_(Toronto). Union Station's impressive main hall houses the VIA Rail ticket counters and information desk. 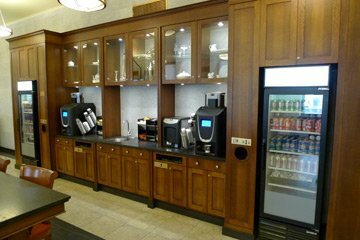 VIA Rail Business Lounge... Business class passengers may use the VIA Lounge before of after their journey, with complimentary tea, coffee and soft drinks. The lounge at Toronto (shown here) is just off the main hall. 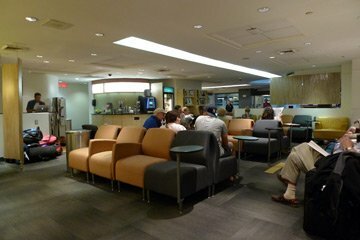 There's a similar but smaller lounge at Montreal. VIA Business Class: The Business Class car has spacious leather seats, and its dedicated steward or stewardess serves a complimentary hot meal with wine, spirits, tea and coffee. 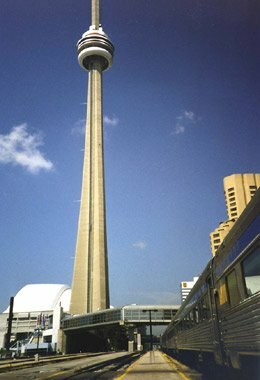 You can easily take the train from Toronto to Niagara Falls (Ontario) either as a day trip, longer trip or as a stopover en route to New York. The Canadian side of the Falls gives great views of the Falls themselves and features both a boat ride (the Hornblower cruise, www.niagaracruises.com) and a walk behind the Falls, www.niagaraparks.com/niagara-falls-attractions/journey-behind-the-falls.html. For trains between Niagara Falls and New York, see the section below. A daily direct VIA Rail train called the Maple Leaf links Toronto Union Station and Niagara Falls Ontario, on its way to and from New York. 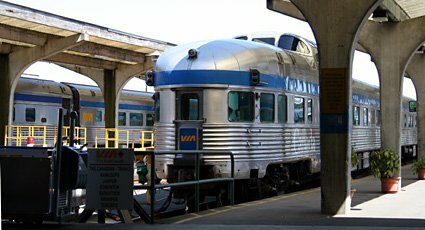 It's ideal for a day trip, and uses comfortable Amtrak Amfleet cars with coach class, a small business class section and a cafe car, even though it is operated by VIA Rail Canada on the section between Toronto and Niagara - an Amtrak crew take over at Niagara. Fares from around $26 each way. 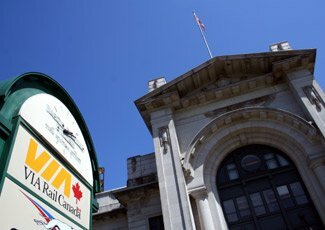 Check times & pre-book tickets at www.viarail.ca. Reservation is compulsory but it's usually possible to buy tickets on the day. Outward: Toronto Union Station depart 08:20 every day, Niagara Falls Ontario VIA station arrive 10:16. Inbound: Niagara Falls Ontario VIA station depart 17:45, Toronto Union arrive 19:42. 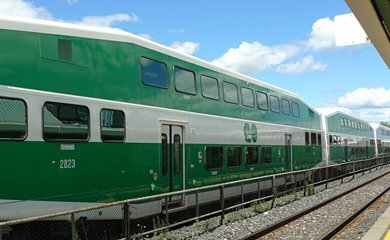 Roughly every hour through the day, distinctive double-decker GO trains link Toronto Union Station with Burlington station, from where a connecting bus runs to Niagara Falls Bus Terminal (located directly across the road from Niagara Falls Ontario rail station). Total journey time 2h49 - roughly 1h05 train and 1h30 bus. This is a simple turn-up-and-go service, no reservation is necessary, it cannot sell out, just buy a ticket for Ca$18 at the station (or bus terminal) immediately before departure. As it needs no pre-planning it's ideal for the return part of a day trip from Toronto, as you don't need to commit to a specific time to come back. You can check bus-rail times at either www.viarail.ca or www.gotransit.com. 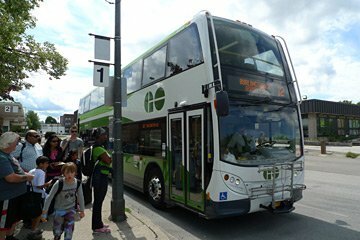 ...and change onto the connecting GO Transit bus to Niagara Falls Bus Terminal. 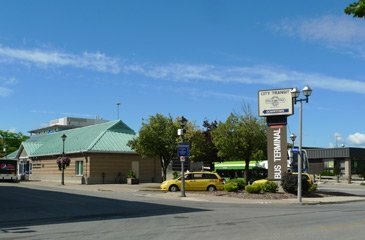 Niagara Falls (Ontario) Station & Niagara Falls Bus Terminal are just across the road from each other in the old downtown area. The falls themselves (and all the tourist attractions) are a mile or two to the south, a taxi to the Falls will cost around Ca$12 + tip and take 5-10 minutes. You'll find plenty of taxis waiting at the station and bus terminal. The station is sometimes called the GO Station, but it's the same one used by VIA Rail. Map showing location of Niagara Falls VIA Rail station, Bus Terminal & the Falls themselves. Niagara Falls VIA station, seen from the bus terminal. 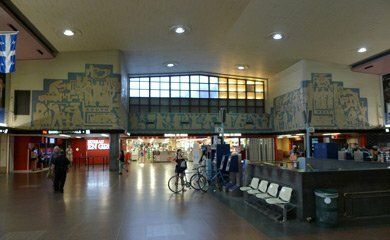 The bus terminal, seen from the VIA station. Niagara Falls seen from the Canadian side (left) and from the Hornblower cruise boat. 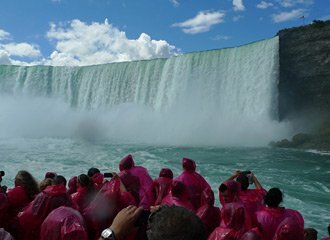 The Hornblower boat trip is the classic Falls boat trip from the Canadian side, see www.niagaracruises.com. VIA Rail's Malahat, just arrived at Victoria on Vancouver Island. This service is currently suspended Photo courtesy of James Chuang. If you're going to Vancouver, don't miss a trip to the British Columbia provincial capital Victoria, on Vancouver Island. Regular buses link Vancouver with Victoria in about 3½ hours, going on board a ferry to reach the Island. See bcfconnector.com for times & fares. Two daily articulated Spanish-designed Talgo trains link Seattle with Vancouver, one morning, one evening. For details, see www.amtrakcascades.com or www.amtrak.com. You can also travel between Vancouver and Seattle via Victoria, using bus to Victoria (bcfconnector.com), then the fast ferry to Seattle (www.clippervacations.com). There is an excellent daily fast catamaran service between Victoria and Seattle, see www.clippervacations.com. 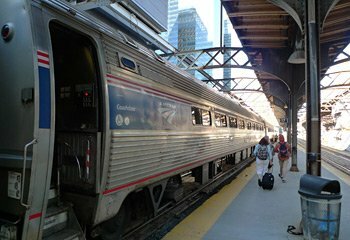 Two excellent trains link New York with Montreal & Toronto every day, with inexpensive fares, comfortable reclining seats, a café car & great scenery along the Hudson River Valley. It's a day well spent, highly recommended. They are run by Amtrak, jointly with VIA Rail in the case of the train to Toronto. 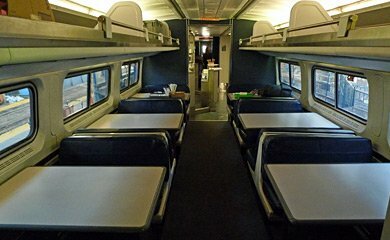 The New York-Toronto train is the Maple Leaf with coach class & business class. The New York-Montreal train is the Adirondack, with coach class. Both trains have comfortable air-conditioned reclining seats and a café car accepting US$ but not Can$. Both trains travel right along the scenic Hudson River valley all the way from New York to Albany, with superb views of the river, including West Point Military Academy, Bannerman's Island and Storm King Mountain. As its name suggests, the Montreal train also heads through the scenic Adirondack Mountains. There are also trains linking Vancouver with Seattle, see the section above. Map showing location of Niagara Falls VIA Rail & Amtrak stations& the Falls themselves. These trains don't have checked baggage, you simply take your luggage with you onto the train and put it on the racks just as you would on any European train. Luggage limits are far more generous than with planes, see www.amtrak.com/baggage-policy. New York-Montreal costs $70. New York to Toronto costs $131. For one-way or return journeys starting in New York, you can check times & fares and buy your ticket online at www.amtrak.com. After booking and paying online you print off a confirmation with a bar-code. At New York Penn station before departure simply swipe the barcode under the scanner of any Amtrak self-service machine and it will print your tickets. 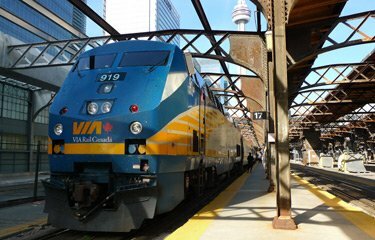 For one-way or return journeys starting in Toronto, you can book tickets online at www.viarail.ca. The VIA Rail booking system may make it look like two trains, but is is in fact just one direct train. When leaving from New York northbound, you present your ticket & passport at a mobile check-in desk on Penn Station concourse where you're asked how many bags you’re taking on board. The agent writes that on your ticket and you’re given the luggage tags for your bags. 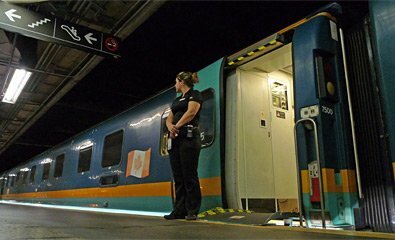 Then you’re allowed on, staff will show which carriage to board if you’re bound for Canada. Leaving from Montreal or Toronto southbound, passengers bound for the USA are given numbered luggage tags for their bags whilst waiting to board, there's then a brief ticket & ID check on the platform. At Niagara Falls USA passengers get off with their luggage, go through US border controls and re-board the train. 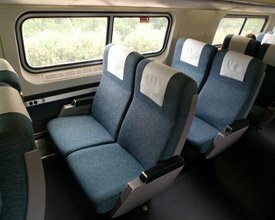 U.S.-based Amtrak Vacations can put a package together to your own specification from the States to Canada. They're VIA/Amtrak specialists so they know what they're doing. 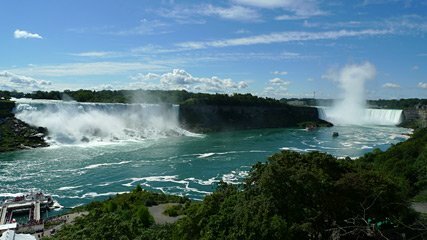 In the U.S. or Canada, call 800-268-7252 toll-free or visit www.amtrakvacations.com. Lines open 09:00-22:00 Monday-Friday & 09:00-17:30 Saturday, Eastern Time. Both the Maple Leaf & Adirondack head out of New York's Penn Station towards Albany along the scenic Hudson River Valley, with the rails often right next to the river. 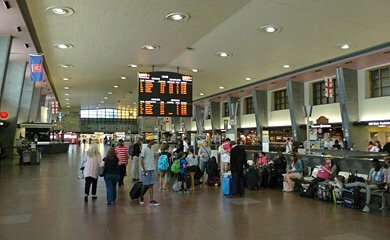 Historically, trains on this route would have left from New York's wonderful Grand Central Station, but a connecting line opened in the early 1990s allows all Amtrak trains to use Penn Station. Above right, Bannerman's Island wit its ruined house is another local landmark. 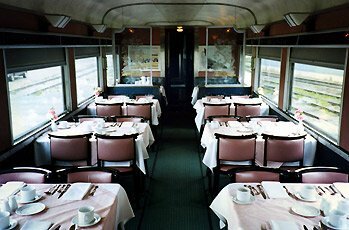 Enjoy breakfast from the cafe car, then in the afternoon perhaps a half-bottle of wine or 'Sam Adams' Boston beer. At Albany, the train swings west and crosses the Hudson river with great views of the State Capitol from the bridge. On the train to Montreal, you'll also pass through the highly-scenic Adirondack mountains; On the Maple Leaf to Toronto, you'll call at Niagara Falls, and although you can't see them from the train, why not stop off there for 24 hours en route? Either way, relax, forget about airport & airline hassle and simply enjoy the journey! 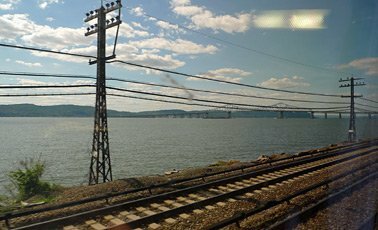 The best views are on the left-hand side of the train heading north from New York, right-hand side heading south from Canada. However, on the Adirondack you'll get views of Lake Champlain on the right of the train going north to Montreal, left heading south from Montreal. VIA Rail's Skeena. Note the Park lounge-observation-dome car at the rear, and the two panorama seating cars immediately ahead of it. These now run in the Canadian between Edmonton & Vancouver. 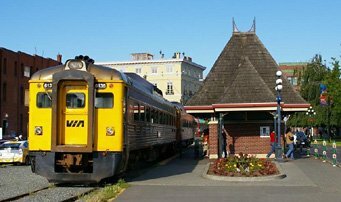 Runs 3 times a week, departing Wednesdays, Fridays, Sundays from both Jasper & Prince Rupert. It's an amazingly scenic 2-day journey, the train stopping overnight at Prince George so you see it all in daylight (you will need to book a hotel separately, it's not included in the fare). Economy class seating is available all year round, 'Touring' class seating is available mid-June to late September. There's a 'Park' lounge-observation-dome car attached at the rear, for all passengers off-season, only for Touring class passengers in peak season (June-Sept). For times, fares & online booking, see www.viarail.ca. Runs 3 times a week, to the land where the polar bears live. See www.viarail.ca. Update: Check the status of this route as service has been affected by major floods in 2017. Runs 3 times a week, attached to the Ocean for part of its journey. see www.viarail.ca. Problems with the track are affecting this route at the moment, probably now extending beyond summer 2012, check the current situation at www.viarail.ca. Long-distance train service due north out of Toronto, run by Ontario Northland, see ontarionorthland.ca. Their Toronto to Cochrane route closed from 28 September 2012 with replacement by bus, but it seems that the Cochrane to Moosonee route is continuing. Please check the current situation at ontarionorthland.ca. 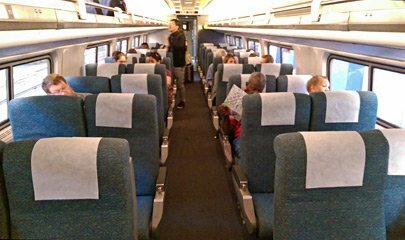 CanRail passes for unlimited travel on VIA Rail in Economy Class seats were discontinued in 2014, but brought back again in 2015. You can buy a pass online directly from VIA at www.viarail.ca. You still need to make reservations, you cannot hop on and off without reserving. And it's for seats, not sleepers. 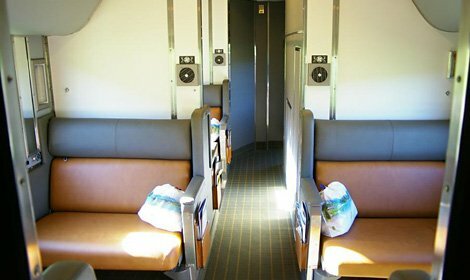 You can make reservations online at www.viarail.ca, but you can only use your pass where an Economy or Escape fare is available, if these are sold out and the only fare available is an Economy Plus fare, you can't use the pass. 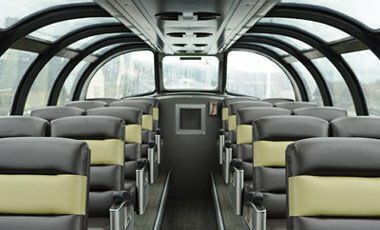 Although if you buy an 'Extra' type pass, you can also book Economy Plus tickets starting from the day before departure - see www.viarail.ca for full details. My advice? Be wary of complex passes requiring reservations that might not be available, rendering the pass useless. 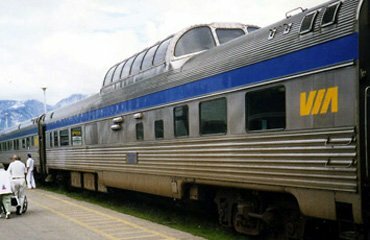 If you want one specific journey or even two or three specific journeys, my advice is simply to book regular tickets at www.viarail.ca, booking in advance for cheap fares just as you would with airline tickets. That's easy, and you know you are safely booked on the train. There are no regular direct passenger ships from the UK to Canada. However, Cunard's superb Queen Mary 2 sails from Southampton to New York roughly once a month between April & November, occasionally twice a month, taking seven nights, see the 'Atlantic ferry' page for details. 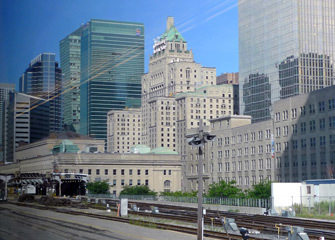 Once in New York, there are excellent daily trains to both Toronto and Montreal, see the USA to Canada section above. Alternatively, there are regular freight ships between Europe & North America which carry a limited number of passengers. Train travel specialists Railbookers can arrange tailor-made holidays to Canada including flights, hotels and a trip on the Canadian right across Canada, from around £2,200 per person. They know their stuff, look after their clients well and get a lot of repeat business. It's an escorted tour with fellow travellers and a professional tour guide. Great Rail Journeys also offer rail-based holidays to other countries. Check the tour details online, then call 01904 527120 to book or use the Great Rail Journeys online booking form. Seat61 receives some commission to help support the site if you book your holiday through this link or phone number, so please mention seat 61 when you book. 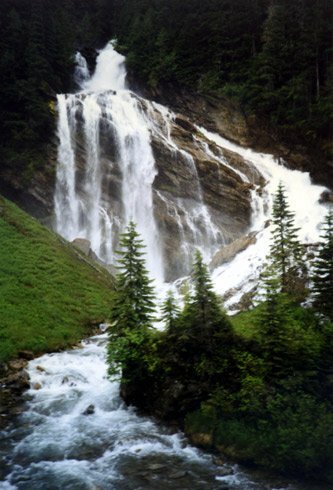 Rail Discoveries offers train-based escorted tours to the Canadian Rockies & Vancouver. Check details & prices at www.raildiscoveries.com and book online or call 01904 730 727. I strongly recommend investing in a decent guidebook. It may seem an unnecessary expense, but it's a tiny fraction of what you're spending on your whole trip. You will see so much more, and know so much more about what you're looking at, if you have a decent guidebook. For the independent traveller this means either the Lonely Planet or the Rough Guide. Both guidebooks provide the same excellent level of practical information and historical background. Trailblazer's Trans-Canada Rail Guide is well worth buying if you're planning a trans-Canada train trip. It will help you plan your journey, has city information for all the major cities served by VIA & Rocky Mountaineer, and best of all it includes mile-by-mile lineside route guides showing what to see from the train on all the main VIA Rail & Rocky Mountaineer services. Buy online from Amazon.co.uk. The Fairmont Royal York Hotel is Toronto's most famous place to stay and one of the world's classic grand hotels with over 1,000 rooms. 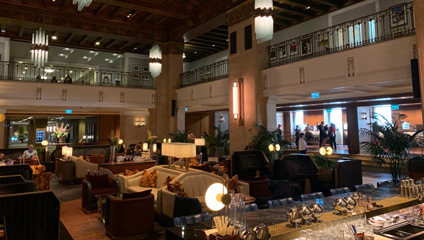 It started life as a railway hotel, opened by the Canadian Pacific Railway in June 1929 - at that time the tallest building in the British Empire. 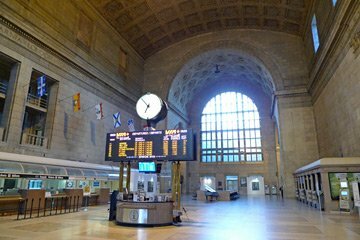 Today it's easily the most convenient, comfortable and historic place to stay before or after catching a train, being directly across the road from Toronto Union Station. 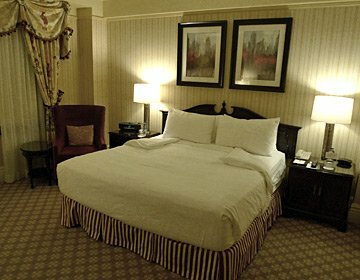 If your budget will stretch, treat yourself to the Royal York! 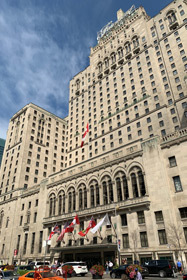 There's more historical information about the hotel at https://en.wikipedia.org/wiki/Fairmont_Royal_York.